For convenience, adjust this swivel barstool from regular bar stool height to counter stool height for wherever you place it. This adjustable swivel barstool is the epitome of efficient minimalist style - perfect for a studio, loft, or casual workspace. It comes in a hammered bronze finish metal frame and a dark wooden seat, creating a handsome industrial-inspired look. An ideal design for bar or work areas. Seat adjusts from 24 1/2" to 29" high x 15" wide x 15" deep. Adjustable swivel barstool from the Elm Lane brand. Hammered bronze finish over metal construction. Dark wood finish swivel seat. Changes from counter stool height to bar stool height. An attractive simple design with adjustable seat height. I want it for use with my drafting table. These stools were selected because of their adjustable height. We have children and grown-ups who will use them. EXACTLY WHAT I WAS LOOKING FOR. JUST PERFECT !!! Using this in my art studio and need adjustable height, no arms and swivel. Like that it has no cloth to be concerned about getting paint stains on it. What is actual composition of wood seat? What is radius or diameter of seat? BEST ANSWER: The seat is constructed of MDF board and measures 15" in diameter. Seat is solid wood. Diameter is 15". 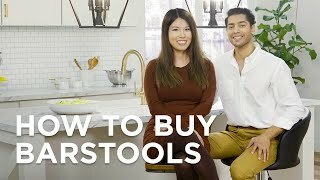 What is the lowest bar stool/chair that you have? BEST ANSWER: Hi, this is one of the lowest barstool/counter stools we offer. Looking for something like this but desk height - maybe 18-24"? BEST ANSWER: I'm sorry, it is not available in the height you are looking for. I like the stool, but would not work well for desk. BEST ANSWER: Hello - The weight capacity is 250 pounds. I have 3 of these and I'm 207 lbs. I would think they hold much more, there sturdy. We're using three of these at our kitchen island and the wood seat matches our cabinetry very well. The design is straight-forward and very functional with great design appeal. Very sturdy and a great addition to our island. Very easy to assemble even without instructions. Delivery was fast via UPS. A great product in general and very satisfied with it! "Perfect for my drafting table"
I like that I can adjust the height if I need to, this is for a drafting table so being able to swivel is great and it's easy to move if I need it someplace else. Nice stool for the price. 2 out of 3 were flawed. Had to return and exchange. Time wasted, Stools should be checked before sold. Does what it suppose to. Sturdy and easy to work from and with. Love these stools. Their height adjusts to a persons size and they swirl so you can be involved in everything going on. They are sturdy and very "cool" looking. Perfect for my family of grandkids and tall men. Exceptional buy!!!!!! Perfect for our Kitchen Island... love them! We needed 4 counter stools for our kitchen island and had been looking all over. So many choices to choose from but also a great difference in pricing. The ones we originally wanted were $299 each which was way over our budget. These we found online and we were happy we purchased them. Very cute and saved us a lot of $$$. Excellent product that meets our needs perfectly. No need for customer service. Arrived on time, in good shape and was easy to assemble. 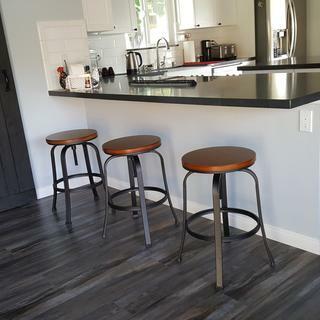 These bar stools are very sturdy ,beautiful ,swivel with ease , they fit our casual country life style perfect . Love these beautiful bar stools ! Great fit for our family . Perfect fit , ready for my wonderful family! Assembly was a little difficult as screws didn't match up well. Too many parts - they're still sitting in boxes. Hi Bonnie D., sorry to hear that you've been unable to assemble your handsome bar stools. Our customer service team would be more than happy to assist with assembly or troubleshooting, so please reach out to them via phone or email for assistance. Thank you.